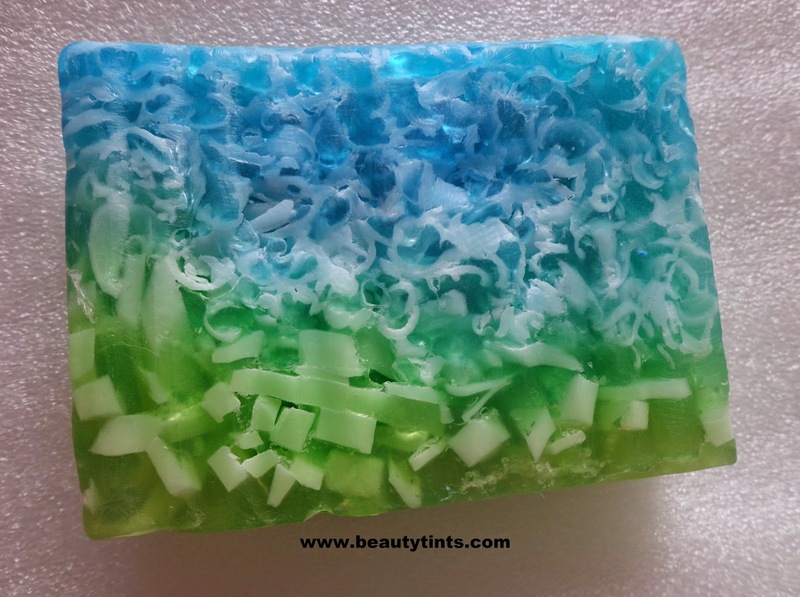 I am starting this month with a colorful soap review which is the Puriso Handcrafted Soap Coral Island .It is so attractive with blue and green combination and smells heavenly. About Puriso : All Puriso soaps are rich with tradition & history. They provide a luxurious body care with fragrances giving rise to exotic scents that capture the inner soul and calm and soothe the body and mind. Imagine indulging in a luxury bath, the goodness and feeling of which lingers with you throughout the day. Nothing evokes more wonderful memories of a relaxing shower than the classic scents of soaps made of pure natural ingredients, which is the reason why soaps made out of pure nature have always been highly valued. After a stressful day, what could be more relaxing than a luxuriously creamy bathing experience? Your cares and tensions will turn into soothing pleasure with our selection of fine, hand crafted Puriso soaps, which are beautifully fragranced with natural essential oils and rejuvenating ingredients. These handcrafted natural soap bars, made using artisanal methods are exquisitely crafted, moulded, textured and packaged beautifully. In fact, they are fragrant works of art, worthy of display and gift-giving. All Puriso –Handcrafted Soaps are enriched with vitamin E and are high in glycerine content, which helps to keep the skin soft, supple and glowing. They are available in a wide range of fruity, floral and woodsy fragrances, exuding rejuvenating, relaxing and refreshing aromas.They help to keep your skin moisturized throughout the day, relieving dry skin from harmful sun exposure.You can check out their face book page as well as their a Website. Packaging :It comes in a attractive and sturdy transparent case with a plastic film packaging inside for double protection. 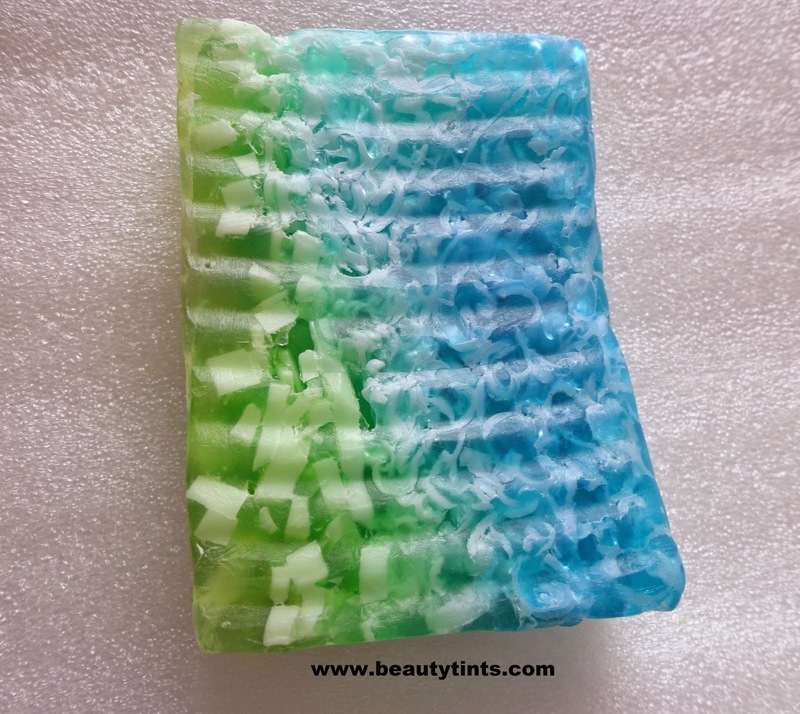 Color and Texture : This is a blue & Sea green colored combination soap with soft texture. creatively designed bar with refreshing aquatic fragrance. Reminiscent of an island!!!! 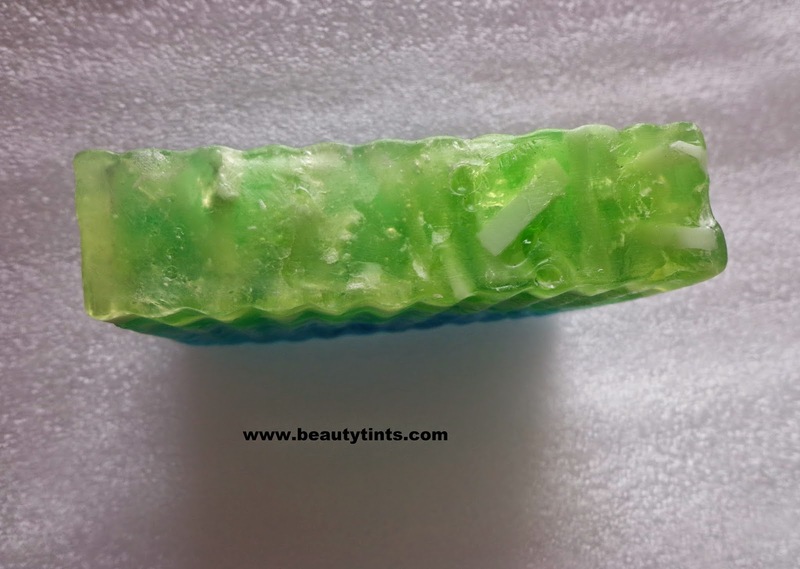 Great for energizing and spirit lifting morning bath!!!! 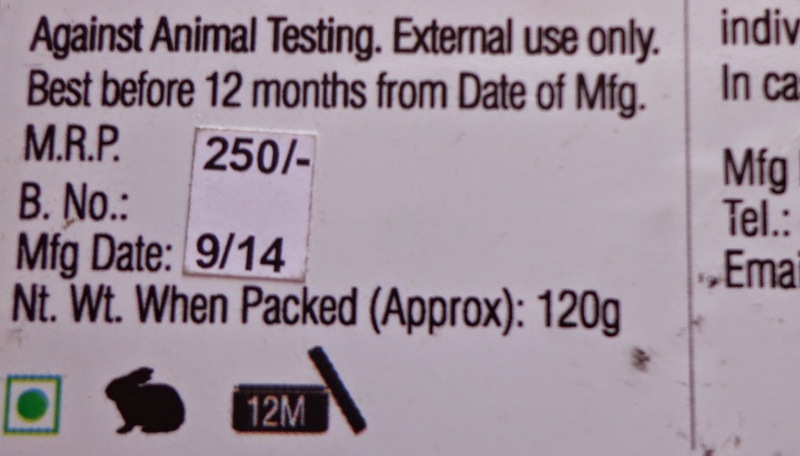 It is rich in glycerine, 100% Vegan and not tested on animals. It is full of skin pampering natural ingredients like shea butter, vitamin E oil & apricot kernel oil. 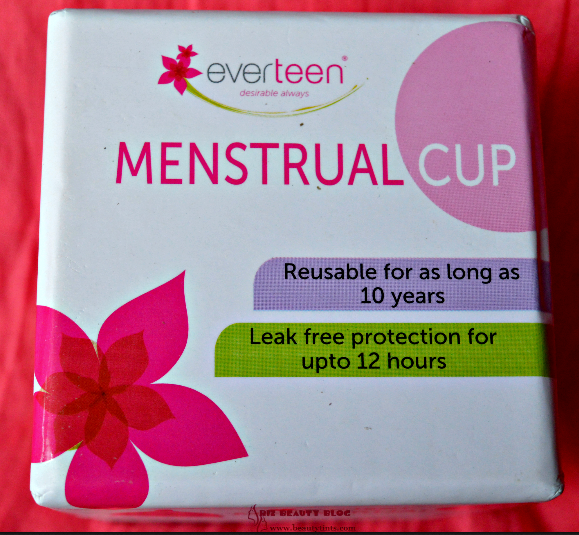 Gives you an amazing bathing experience!! Great for gifting!! Bestseller!! Availability : Available in few online stores,You can buy it here. 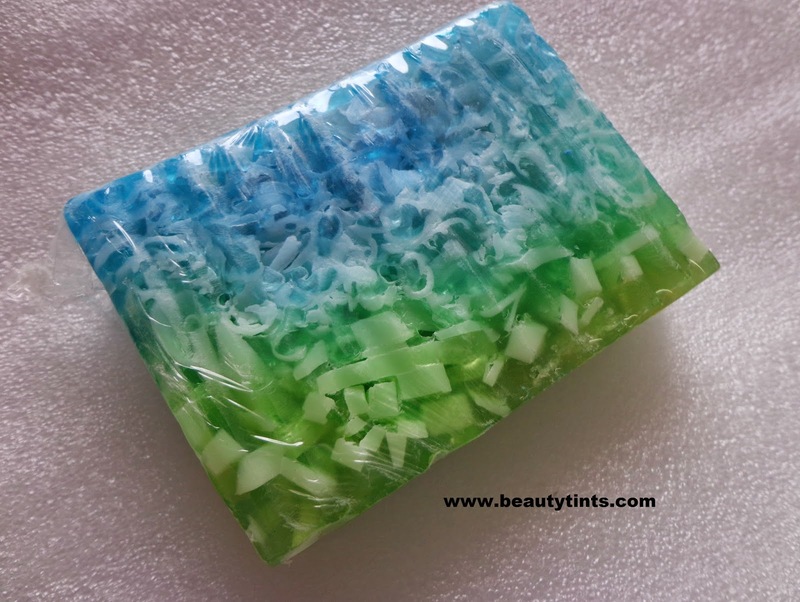 Ingredients : Vegetable oil soap base,Shea Butter,Vitamin E oil,Apricot Kernel Oil,Essential Oil,Fragrance & color. 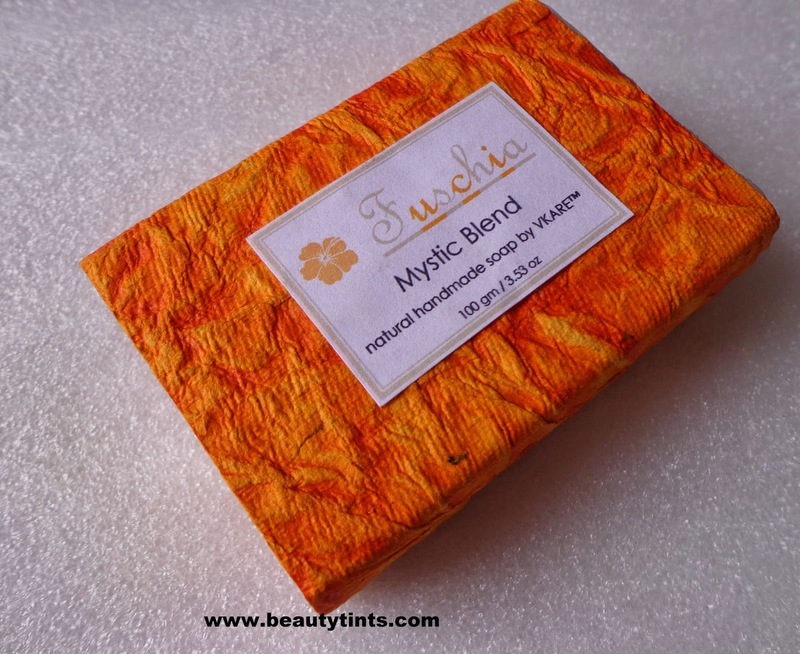 The first thing to describe about this soap is the beautiful and attractive color and packaging.Each soap has its unique color and fragrance.This particular Coral Island soap smells heavenly with fresh aquatic scent.The fragrance lingers for a good 1-2 hours on the body as well as in the bathroom.The fragrance is so soothing and relaxing.It lathers well with a creamy foam which is quite moisturizing enough for my normal skin.Dry skin may feel it a bit drying.It cleanses the skin thoroughly making it squeaky clean.It does not melt at room temperature and retains it shape till the end.The soap-chunks inside the soap,gives the feeling of gentle scrubbing. 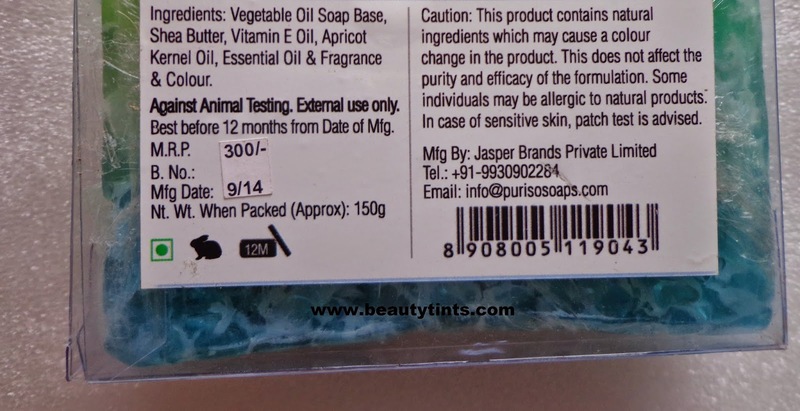 This soap is enriched with the goodness of Shea butter,Apricot Kernel Oil,Vitamin E.This is a big soap which does not fit completely in the hand,So,it is better to cut the soap into 2-3 pieces to use it comfortably.It is a organic soap which is free of parabens and harmful chemicals. 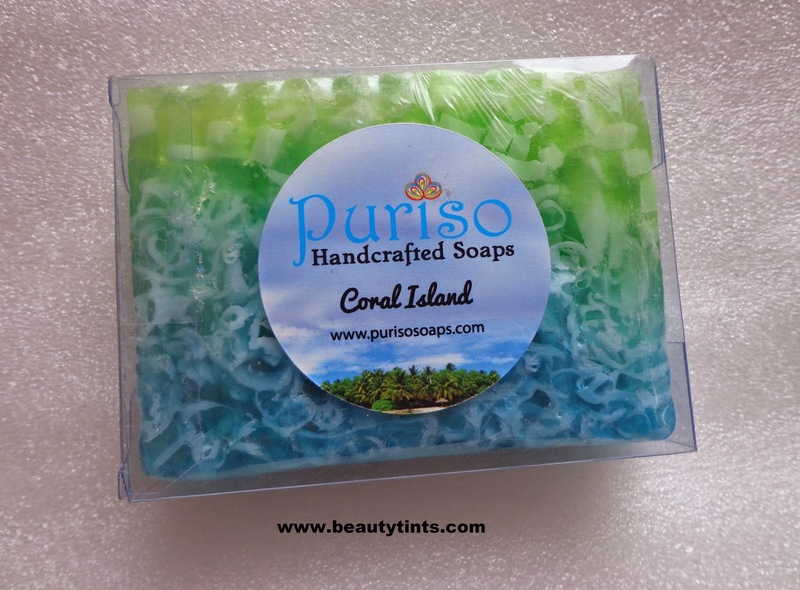 Final Conclusion about Puriso Hand Crafted Soap Coral Island: Those who want to experience a luxurious and exotic bathing experience similar to a Spa should give this a try!!! 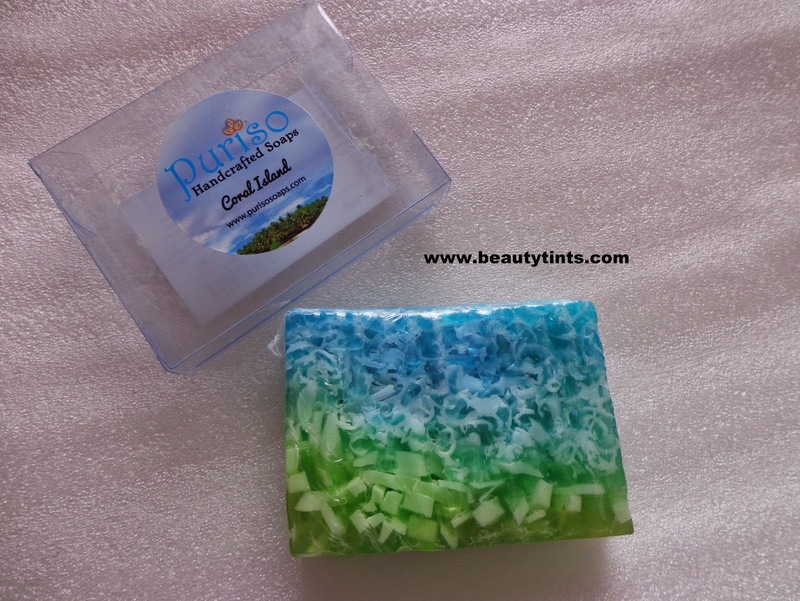 Also Check out the reviews of Puriso Rustic grass and Indian Healing soaps here. Best Ways To Celebrate Life Every Day!!! Dr.Batra's Hair Vitalizing Serum Review!!! Winsome Ads to #CrashThePepsiIPL !!! 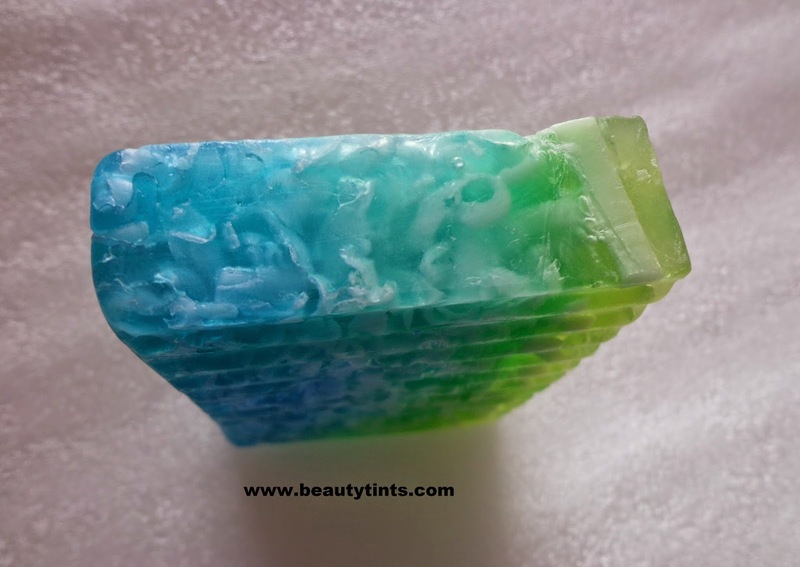 BON Organics Luxurious Spa Soap Review! Real Heroes Of Our Country!!! The Inspiring Story Of RK!!! 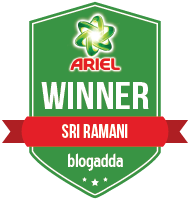 Juvena Herbals Gold Aha Glow Pack Review! 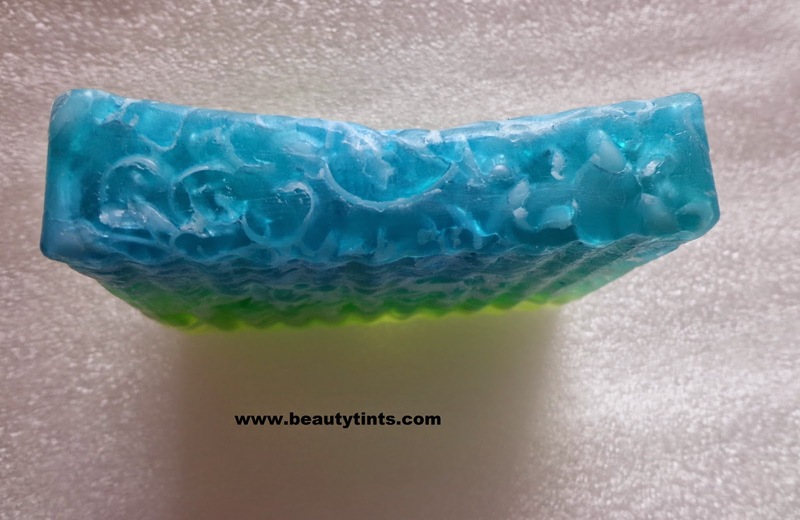 Avon Foot Works Cracked Heel Cream Review!!! The Great Nykaa Summer Sale Is Back!!! Worst Video Ads I have seen!!! Everything that's Wrong With Ads Today!!! Our Best Wishes On Your Birthday!!! 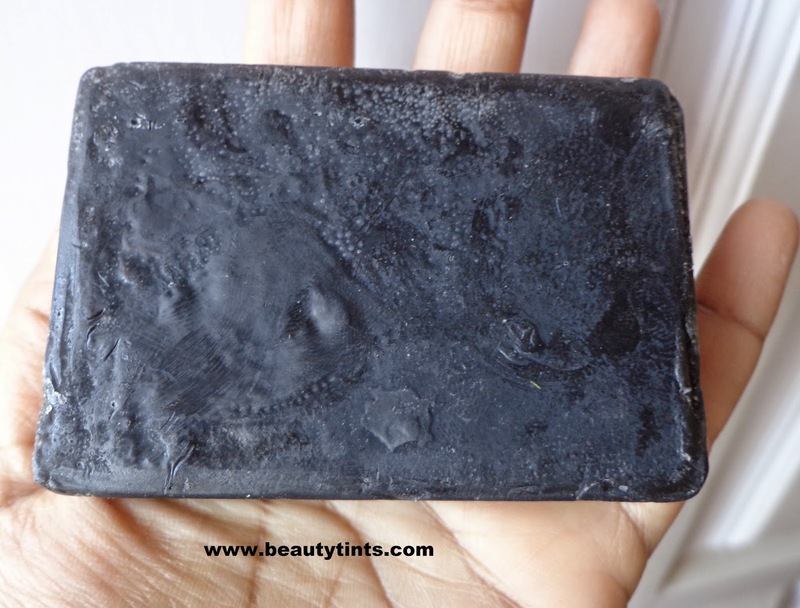 Inatur Herbals Sandal Fairness Face Wash Review! My First Haul from Bon Organics!! !